Yesterday I blogged about Albert Spalding and his world baseball tour. Today I’m going to talk about a tour you can take when you’re spending some time here in AZ for spring training. As featured on our AZ FUN page page for a few years, I finally got a chance to meet the nice folks at Apache Trail Jeep Tours. They sent me out on the “Legends, Lores, and Lies” tour, a four hour drive through the majestic canyon area, of the Apache Trail. The journey starts at Goldfield Ghost Town, about 30 minutes East of Hohokam Stadium on Mammoth Mine Road just off the historic scenic highway 88. At Goldfield, you’re greeted by one of the trailmasters. Our guide was Laredo Larry who began by telling us “it got so hot during the summer in these parts that the farmers fed their chickens crushed ice so they wouldn’t lay hard boiled eggs”. He then said, “You’re free to decide what is legend, lore, or lie”. At that point, we realized this wouldn’t be any ordinary Sunday drive. 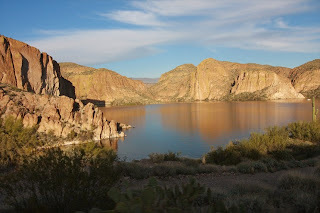 The Apache Trail was an old stagecoach route in Tonto National Forest. Tonto is 3 million acres of rugged Arizona beauty, and is the largest of 6 parks in the state and 5th largest National Forest in the country. 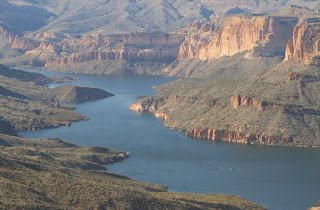 Tonto is home to many animals, among them Big Horn Sheep, Coyote, Mountain Lion, Bobcat, Deer, Javalena, and Eagle. As we drove through the area, Laredo Larry told us the tale of Jacob Waltz, the lost Dutchman, and his legendary lost gold mine, and continuing on, my thoughts kept drifting back to the clues he gave on his deathbed – ‘in the shadow of Weaver’s Needle, facing the north side of Superstition Mountain’. Riding in the open air Jeep through the wilderness hearing these stories it’s not hard to picture a time when prospectors, miners, ranchers, bandits and Native Americans roamed this rugged area. At one point Laredo Larry takes out his pocket knife, cuts off a stem of the Jumping Cholla Cactus, burns off its spines, and cuts it open to let us taste the fleshy green center. Arizona’s Apache natives relied on the Cholla and prickly pear cactus as part of their diet. Containing beta carotene, iron, some B vitamins, and good sources of both vitamin C and calcium these cacti are on the Cubs training table menu. A little of Laredo Larry may have rubbed off on me in writing the end of that last sentence. We also heard the story of Elisha Marcus Reavis, the “old Hermit of The Superstition Mountains” one of the most enigmatic individuals to wander the Old West. The trail winds its way through the steep Fish Creek Canyon and then works its way to the summit of Reavis Mountain (named for the old hermit) where a breathtaking view of Apache Lake gave me an opportunity to take some photos. 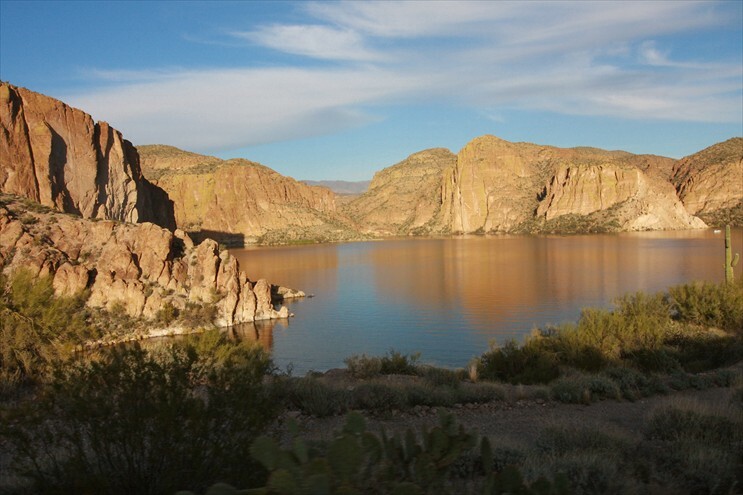 It’s easy to see why Roosevelt was so taken by the area, and the Apache Trail Jeep Tour is a great way to take it all in. The scenic beauty of this expansive desert landscape, combined with fresh air, intriguing history, and incredible views is one amazing and fun journey. 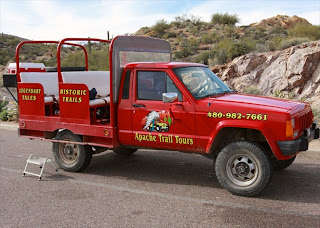 Check out apachetrailstours.com for details about the variety of tours they offer around the Superstition Mountains, Apache Trail, and Four Peaks through Tonto National Forest. For more of my photos from the Apache Trail Tour see our facebook page, Boys of Spring – Wrigleyville West.